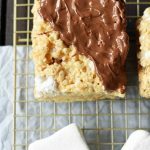 This Classic Rice Krispie Treats Recipe creates a soft, oeey-gooey, melt-in-your-mouth dessert bar. There’s a reason why Rice Krispie Treats are so popular! 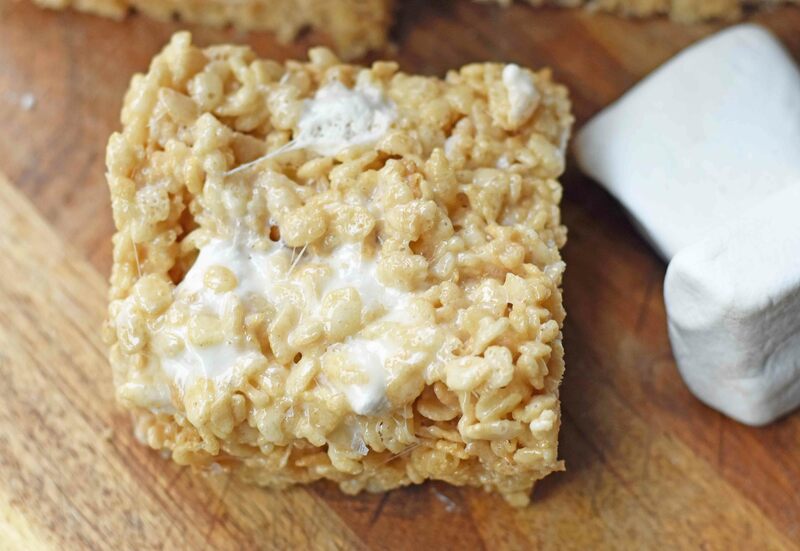 Tips and Tricks for making the BEST Rice Krispies Treats. 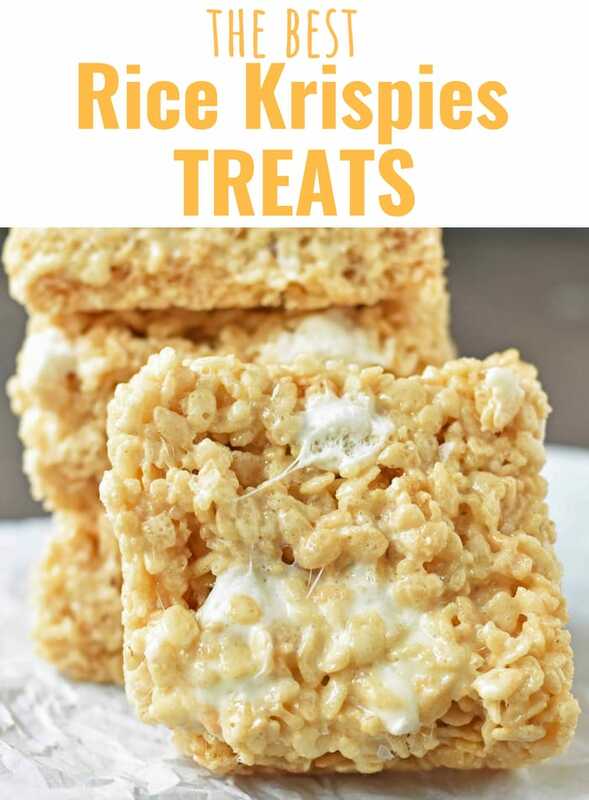 You will find out how to make soft and chewy rice krispies treats. 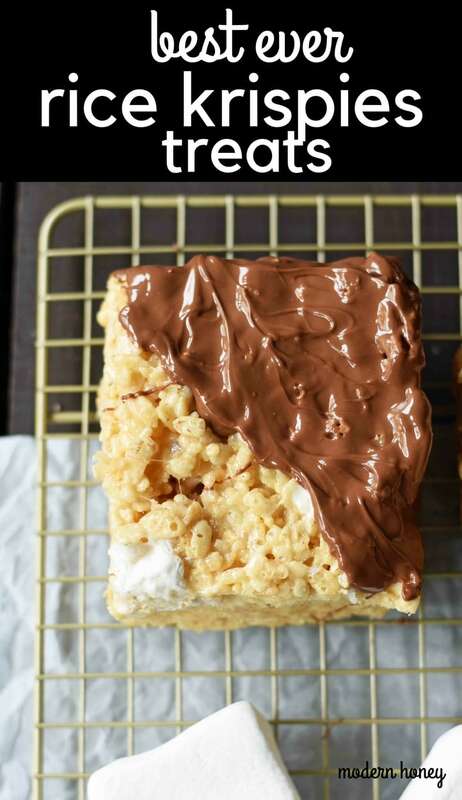 This is the perfect rice krispie treat recipe and everyone will be begging you for the recipe. I have been doing a fair share of recipe testing. If you know me well, I am a little rebellious in the kitchen. I don’t always like to follow recipes to a T. I try it once and then figure out if there’s a way it can be made even better. This is precisely what happened with this rice krispie treats recipe. I grew up making the recipe on the back of the marshmallow bag but I wanted soft, chewy, ooey gooey rice krispie treat squares. What ingredients are in Rice Krispies Treats? 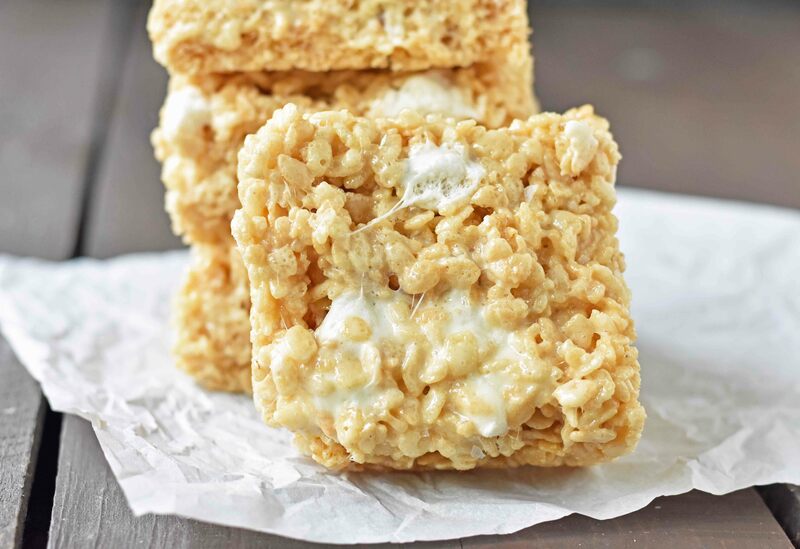 Rice Krispies Treats are made up of only five ingredients — Rice Krispies cereal, marshmallows, butter, vanilla, and a pinch of salt. It is the ratios that matter. Bring on more butter. Bring on more marshmallows. 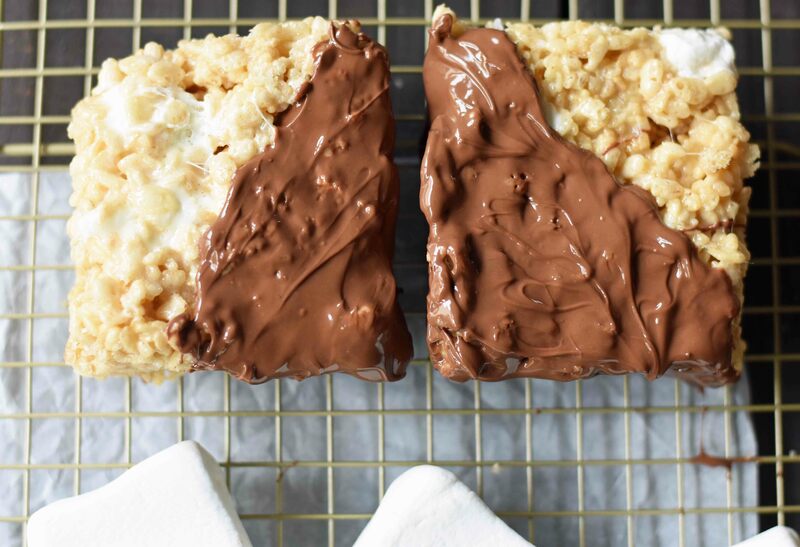 This is why these rice krispies treats literally melt-in-your-mouth. Start with BUTTER. Everything is definitely better with butter and it serves as the base of this sweet treat. Completely melt the butter before adding the marshmallows. If you love the taste of brown butter and want to make Brown Butter Rice Krispie Treats, continue to melt the butter until it becomes a rich golden amber color. Be careful not let it get too dark. Butter can burn quickly and that would be sad. Stir in MARSHMALLOWS. This recipe calls for two bags of marshmallows. Oh yes, I sure did. 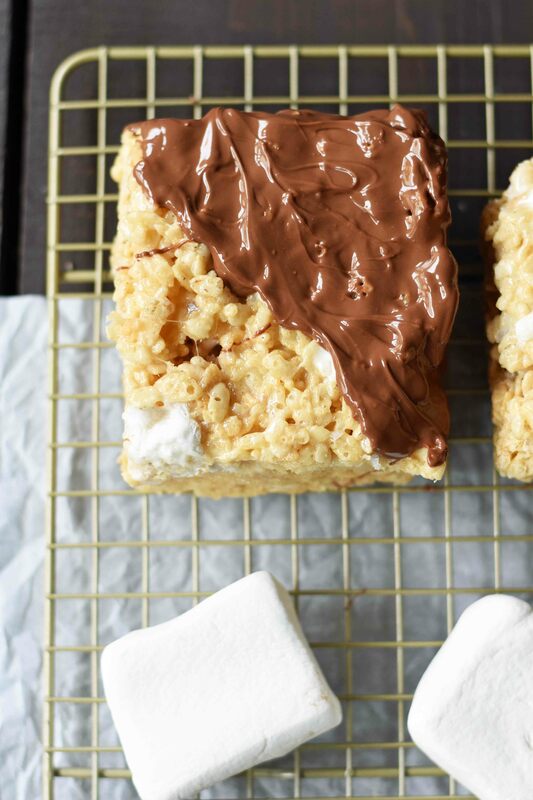 If you want a soft, chewy rice krispie bar, you need to add more marshmallows. Reserve 2 cups of marshmallows to add at the end. Stir often and remove from heat as soon as marshmallows are melted. Add VANILLA extract. It adds a depth of flavor to the rice krispie treats and definitely elevates them to another level. Stir in RICE KRISPIES cereal. Remove from heat and add remaining 2 cups of marshmallows and rice krispies ceral. Fold the mixture well to incorporate all of the ingredients. Spread into greased or foil-lined pan. A 9 x 13 pan works brilliantly. This is my favorite 9 x 13 pan to use for dessert bars. You can also use a 9-inch square pan if you want extra thick rice krispie squares. This is my favorite 9-inch square pan. Let sit for 20 minutes to set. Cut into squares. To make Chocolate Covered Rice Krispie Treats…dip into milk, semi-sweet, or dark chocolate, it is very easy. Simply melt the chocolate of choice in a microwave at 50% power or over a double boiler. Dip rice krispie treats in chocolate and let firm up on a cooling rack or parchment lined baking pan. 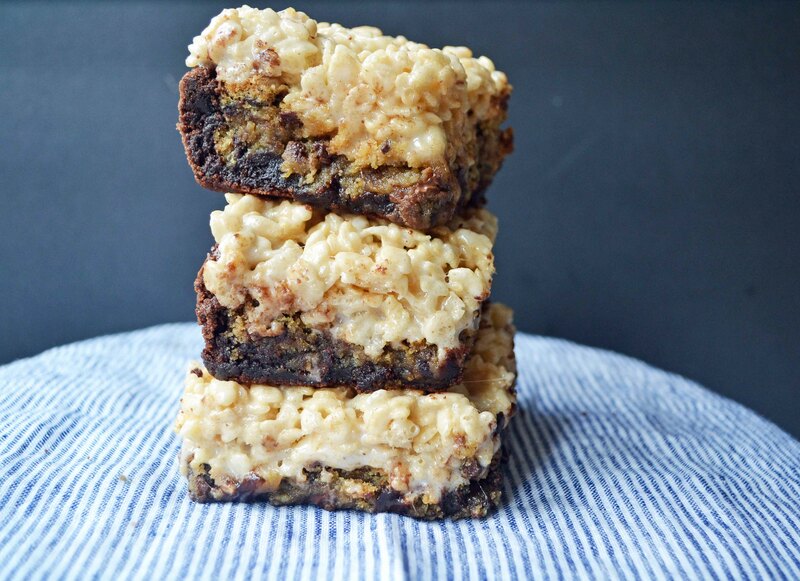 Trifecta Bars Recipe — a three-layer dessert bar comprised of a layer of chocolate chunk brownie, a chocolate chip cookie layer, and a soft, ooey-gooey rice krispie treat on top. This recipe actually won the Food Network Magazine Best Bake Sale Treat Contest and landed me on the cover of Food Network Magazine. I still can’t believe that actually happened. A bucket list dream came true without a doubt. If you want to make this show-stopping dessert bar, click HERE for the recipe. How to make the best rice krispie treats in all of the land. In a large pot, melt butter over medium heat until completely melted. If you want to brown butter, let it melt until it starts to foam and becomes a golden amber color. Watch carefully. Once butter is melted, stir in marshmallows, reserving 2 cups to add later. Continue to stir often as marshmallows begin to melt. Once marshmallows are melted, remove from heat. Stir in vanilla and stir to combine. Add rice krispies cereal. Fold the mixture well to ensure all ingredients are incorporated. Add remaining 2 cups of marshmallows and fold together. Spread in greased or foil-lined 9 x 13 pan. If you desire a thicker bar, use a 9-inch square pan. Let bars sit for 10-20 minutes. Cut into squares. If you want to dip into milk, semi-sweet, or dark chocolate, it is very easy. Simply melt the chocolate of choice in a microwave at 50% power or over a double boiler. Dip rice krispie treats in chocolate and let firm up on a cooling rack or parchment lined baking pan. Browning the butter definitely makes a huge difference, even if you don’t make any of the other changes. Yum! I made these on Sunday and I know it’s just a few tweaks but they are SO MUCH BETTER THAN NORMAL. Seriously, I’ll never make rice crispy treats another way! These are delicious and very gooey! Will definitely use this recipe in the future! Thanks!